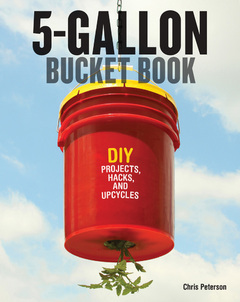 This is quickly becoming my favorite go-to book for anything and everything that can be done with a 5 gallon bucket. Of course, I already was familiar with the composting toilet, the washing machine and the planters. This book contains more than 50 projects for around the homestead (and the home) that can be completed with 5 gallon buckets! Including a trash compactor, wine rack, and toddler swing. I have currently gathered supplies for making the manual washing machine – handy for the rv or any off-grid situation, and the rolling composter – a design that I think is much more efficient for our rving homestead. I just need the time to make them. Be sure that I will be posting pictures and such when I do! Inspired by, but not included in the book, is a design for a spin-dryer for clothes, that I am going to experiment with. Details to follow when I get to that one. All the projects in the 5 Gallon Bucket Book come with detailed instructions and lots of pictures. Also supply lists for each project and how it is supposed to work and be used when it’s done. Many of the projects are perfect for off-grid applications; some use electricity. The 5 Gallon Bucket Book is a great investment for any do-it-yourselfer looking for more economical solutions to everyday issues in the home and garden. With this book and a few simple tools, you can make dozens of practical upgrades to your homestead. Thanks to the good folks at Quarto Publishing for providing me with a free review copy of this book. No other compensation was received for this review.